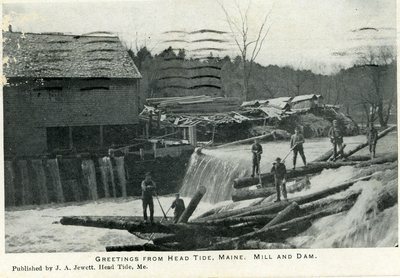 "Head Tide, Maine, Mill and Dam "
An image scanned from a postcard of men standing on jammed logs in a river. Text at the bottom reads, "Greetings from Head Tide, Maine. Mill and Dam. Published by J. A. Jewett, Head Tide, Me." The image is not dated, but the postmark on the back of the card is from Oct. 24, 1940.